Now that we’ve covered some guiding principles in post 1, let’s get your data organized for building your tree. This will be more of a challenge for larger inventories, but also of greater importance. The more products you have in store, the more essential it becomes to get that data well organized, and allow your customers to navigate to their desired products as quickly and effortlessly as possible. First, let’s map those part numbers to product categories, so we can get an overview of what’s going where. Create a spreadsheet with ‘Part Number’ or ‘SKU’ in the first column, then ‘Primary Category’ and ‘Secondary Category’ in the second and third column. One of the challenges setting up your categories is when you have different products that come with the same part number. This is a topic we regularly discuss with manufacturers, as we believe they could help us all by breaking down the ‘part type’ product data a little further. For example, in automotive there’s generally only one part type for Tonneau Covers, but within that you have hard folding tonneau covers and soft rolling tonneau covers, which deserve a different category in store, but they aren’t separated by the original data (usually the more detailed breakdowns appear in the product title, attributes and description). Another example is bumpers, which come as only one part type, but to create a successful Ecommerce category navigation you will need to separate front and rear bumpers. You might find this in your industry and niche, such as T-Shirts with externally affixed tags vs. T-Shirts with tags printed inside. These may carry the same part number, and yet you’ll need to split them into different categories, because the position of the tag is something your customer will want to know (and choose) before they make their purchase. You may need to create a new spreadsheet column between ‘Part Number’ and ‘Primary Category’ and input your own in-house SKU. Then map those SKUs to your desired categories, such as ‘Front Bumpers’ and ‘Rear Bumpers’. While mapping your categories you may find that some products have multiple uses. A good example of this is the lighting category. Within automotive alone, you may need lighting in the general ‘Lighting’ category, and also need it in the ‘Recovery’ and ‘Towing’ categories too. Non-automotive stores may have other uses for lighting, including indoor, outdoor, weatherproof, portable, emergency lighting and so on. A huge advantage of running an Ecommerce store over brick and mortar is the opportunity to put products in multiple categories, making them easier and faster to find. I remember one time at Home Depot I was looking for one particular type of finished redwood lumber. On this particular occasion, I was shopping in a Home Depot that I don’t usually go to. Since the layout of the store was different to the store I was used to, the lumber wasn’t in the place I expected it to be, and I couldn’t find it. After walking up and down the aisles and asking several employees, it took five guys and a computer check to eventually come across this redwood lumber in the garden section, where they had a fencing display. As fencing wasn’t the reason I was looking for the lumber, I didn’t look there first, and so it took a lot of searching to find it. Remember that once you are in a brick and mortar store, the effort and pain it takes to go to a different store is very high, so customers are more likely to stick around in the store searching for what they need. With Ecommerce it’s not like that. A customer can bounce to the next store with one click, and may never come back. Luckily, we can avoid this issue altogether by placing the same item in multiple categories. So whatever your customer’s reason for searching for the product, they should always find it quickly. If you have more than 2 or 3 ‘Secondary Categories’, just create new columns on your spreadsheet to accommodate them, such as ‘Secondary Category 1’, ‘Secondary Category 2’ and so on. 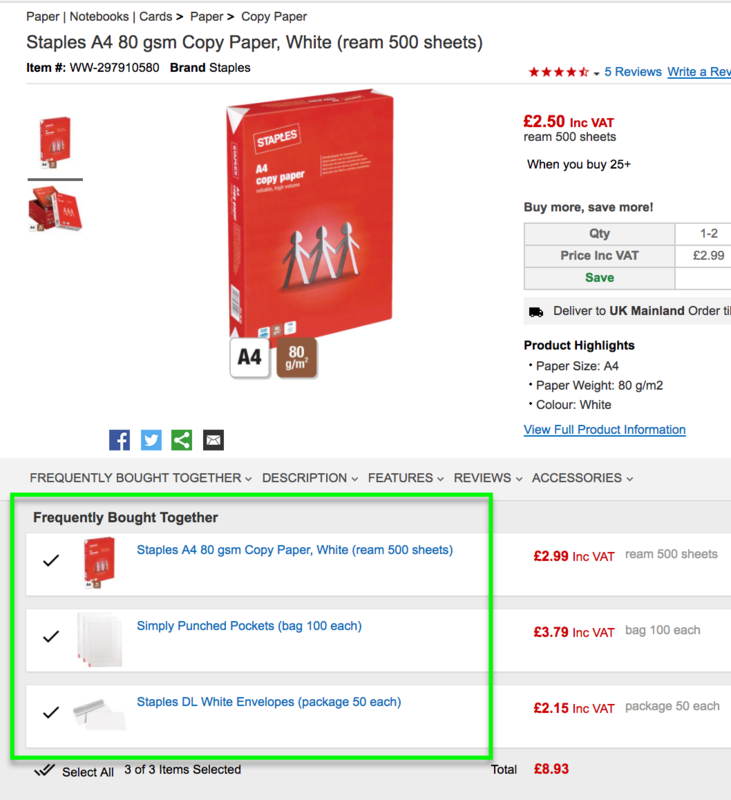 Staples UK offering relevant, related cross sells to customers browsing for paper. Create a new column or two on your spreadsheet called ‘Cross Sell 1’, ‘Cross Sell 2’ etc to show which categories that item should be cross sold into. Finally, get clear on how you will group your products. The size of your inventory and the range of your products will be a defining factor here. If you are selling everything under the sun in the automotive industry, then you will be breaking it down into larger groups, such as: Accessories -> Bumpers -> Front & Rear -> Color -> etc. But if you were a store specializing in bumpers, then there is no need for the larger groupings, and you dive right into the more specific groups such as: Front bumpers -> Size -> Color -> etc. Or: Brand -> Model -> Color -> etc. All these groupings will be treated as ‘categories’ that will become landing pages for you to drive traffic to via SEO, PPC or other sources. This is an exercise you can carry out in a separate document, on paper or on your whiteboard with your team. Just make sure the overall strategy of your product groupings makes sense at this point. You’re ready to build your category tree! Now you have your data prepared, it’s time to put it into action and build a high performing category tree that boosts sales. Check out our next post when you’re ready to go! Have questions about preparing your data? Let us know and we’ll help you out in the comments below!